Providing you the best range of cetirizine tablets bp 10 mg, meclizine hydrochloride tablet usp 25 mg, montelukast sodium & levocetirizine hydrochloride tablet, montelukast sodium tablet 10 mg, cinnarizine 25mg tablet and antidotes medicine with effective & timely delivery. Brand Livealth Biopharma Pvt. 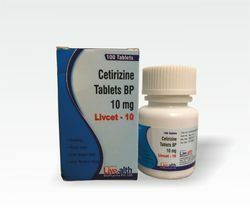 Ltd.
Cetirizine 10 mg Tablets is an antiallergic medication. for the relief of symptoms of hay fever (seasonal allergic rhinitis) and allergies such as dust or pet allergies (perennial allergic rhinitis), such as sneezing, itchy, runny and blocked nose, red and watery eyes. Uses It is used to prevent nausea, vomiting, or dizziness caused by motion sickness. 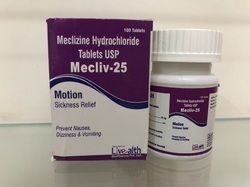 MECLIZINE (MEK li zeen) is an antihistamine. It is used to prevent nausea, vomiting, or dizziness caused by motion sickness. It is also used to prevent and treat vertigo (extreme dizziness or a feeling that you or your surroundings are tilting or spinning around). Packaging Details: 100 Tablets in a plastic jar in a printed carton. Montelukast Sodium / Levocetirizine Hydrochloride is used for Inflammation of the nose due to an allergy, Allergic rhinitis, Chronic idiopathic urticaria, Exercise-induced bronchospasm prevention, Controller medication for asthmaand other conditions. This salt combination may also be used for purposes not listed in this medication guide. Montelukast belongs to a group of medications known as leukotriene receptor antagonists. It is used to prevent and manage asthma symptoms and to relieve the symptoms of seasonal allergies, also known as seasonal allergic rhinitis or hay fever. It works by blocking the effects of leukotrienes, a substance produced by the body in response to certain "triggers" that cause narrowing and swelling of airways in the lungs. Montelukast usually starts to work within one day. 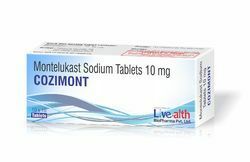 When used to prevent and manage asthma, it is important to understand that montelukast should not be used to relieve an asthma attack once it has started. People with asthma should always have their fast-acting asthma relief medication on hand to treat an asthma attack. Cinnarizine is predominantly used to treat nausea and vomiting associated with motion sickness, vertigo, Meniere's disease, or Cogan's syndrome. In fact, it has been shown to be beneficial in the treatment of vertigo and tinnitus, associated with Meniere's disease. Packaging Details: 100 Tablets in a jar in a printed carton. More pesticides (insecticide chemicals) spray on crops like fruit and vegetable due to side effect accruing like growth check, abnormalities in fruits and vegetable. Use of antidotes reduces side effect in crop and increases yield and get high quality product. Internal secretion and Hormone reactivity increase. Looking for “Anti Allergic Drugs”?